Forget cakes and cookies, mac and cheese is my comfort food of choice. And luckily, there is no shortage of variations on this classic, so it just never gets old. :) This White Cheddar Mac and Cheese is incredibly simple, fast, easy, and a little more well rounded than plain mac and cheese, so it’s totally meal-worthy and perfect for busy weeknights. The flavor is a little smoky, a little garlicky, and full of that wonderfully sharp white cheddar. In other words, soooo good! First, do NOT substitute the evaporated milk. 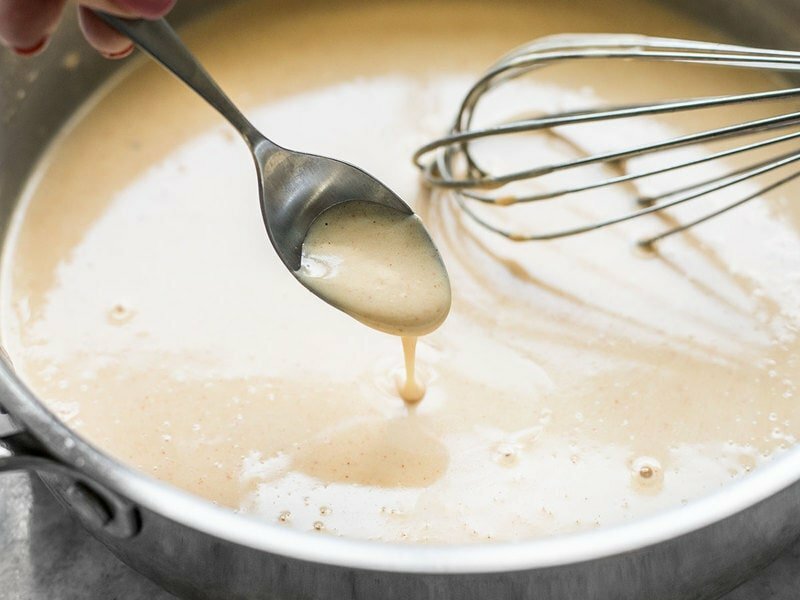 This unique composition of this ingredient (low moisture, high protein) is what allows the cheese to emulsify into a smooth sauce. It will not work with regular milk, or dairy milk substitutes. Low Carb – Substitute the pasta with cauliflower florets. Vegetarian – Substitute the chicken with tempeh, or cauliflower florets. Cauliflower is a pretty versatile ingredient and just happens to go great with cheese sauce (see my Spicy Roasted Cauliflower with Cheese Sauce recipe). 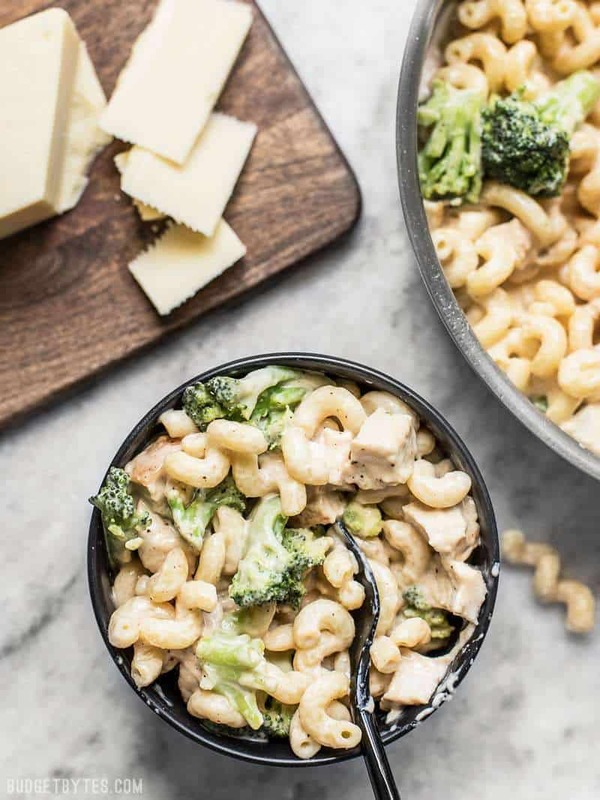 Simple, delicious, and totally comforting, this White Cheddar Mac and Cheese is the perfect quick fix for weeknight dinners. Bring a pot of water to a boil for the pasta. Once boiling, add the pasta and continue to boil until tender. Add the frozen broccoli florets to the pot of boiling water and pasta, and continue to cook for 2 minutes. 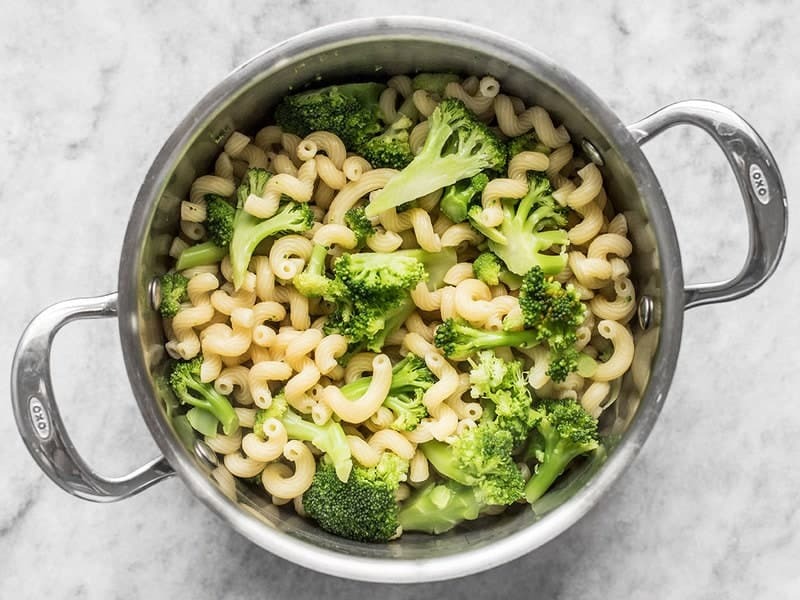 Drain the pasta and broccoli together in a colander. While the pasta is cooking, prepare the chicken. Season both sides of the chicken breast with a pinch of salt and pepper. Add one tablespoon cooking oil to a large, deep skillet and heat over medium. 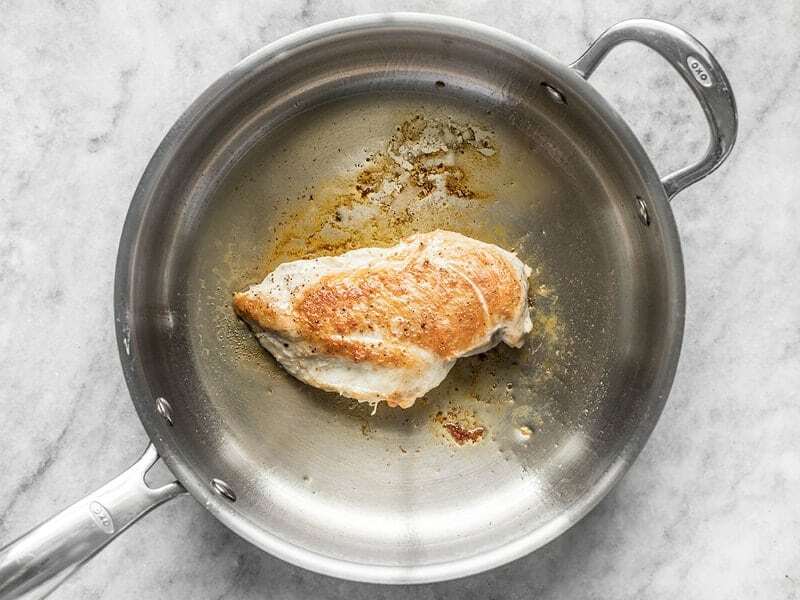 Once hot, swirl the oil to coat the surface of the skillet, add the chicken breast, and cook on each side until golden brown and cooked through (about 5-7 minutes per side). Remove the cooked chicken to a clean cutting board and allow it to rest for five minutes, then chop it into small cubes. Turn the heat under the skillet used to cook the chicken down to medium-low, and add the butter. 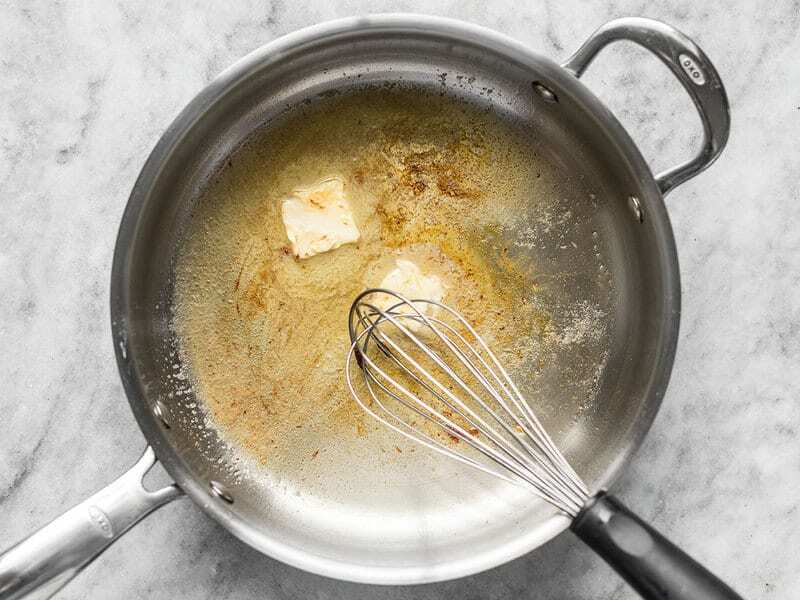 Allow the butter to melt, and use a whisk to scrape up the browned bits from the bottom of the skillet. 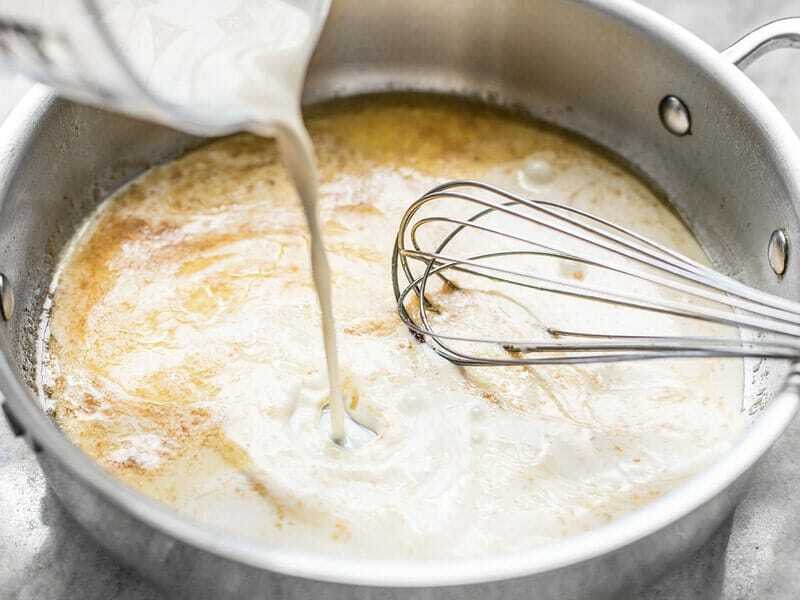 Pour in the evaporated milk and continue to whisk to dissolve the browned bits completely off the bottom. 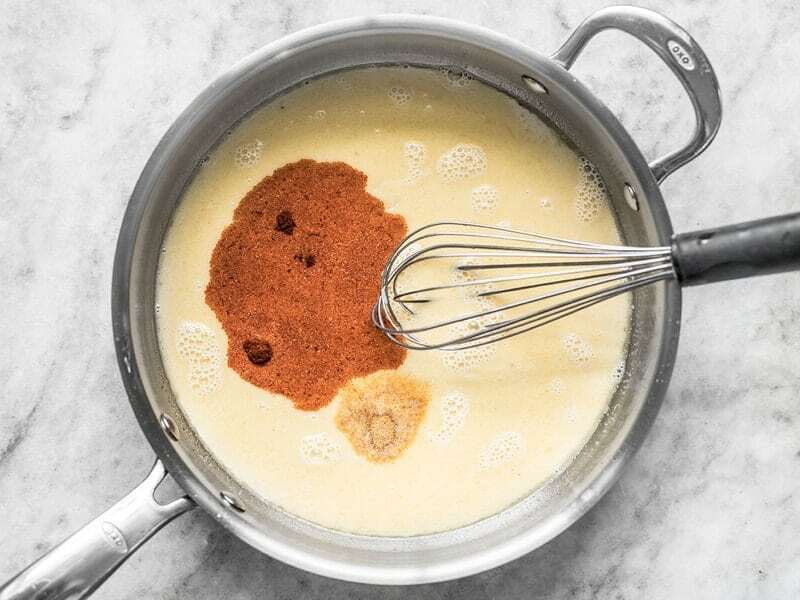 Whisk the garlic powder, smoked paprika, and salt into the evaporated milk. 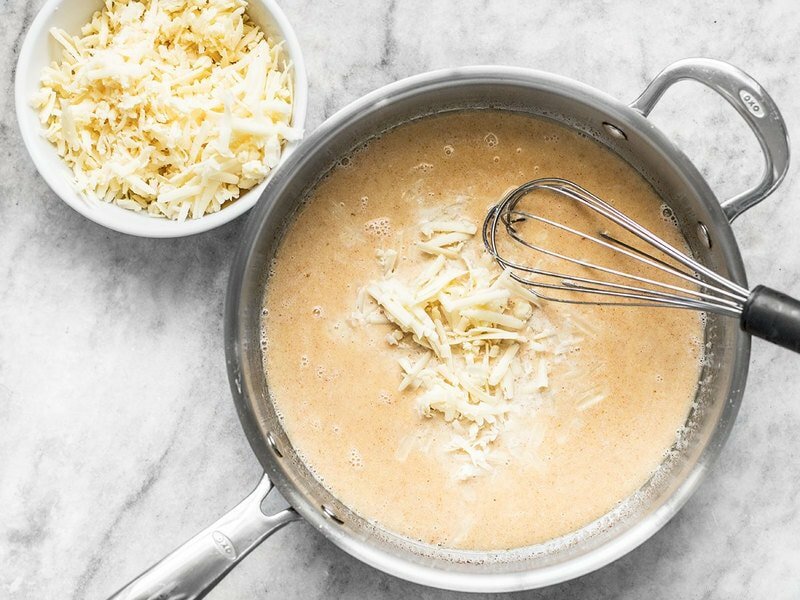 Once the evaporated milk is hot, begin adding the shredded white cheddar, one handful at a time, whisking until it is fully melted before adding the next handful. Once all the cheese has been whisked into the hot sauce, turn the heat down to low. 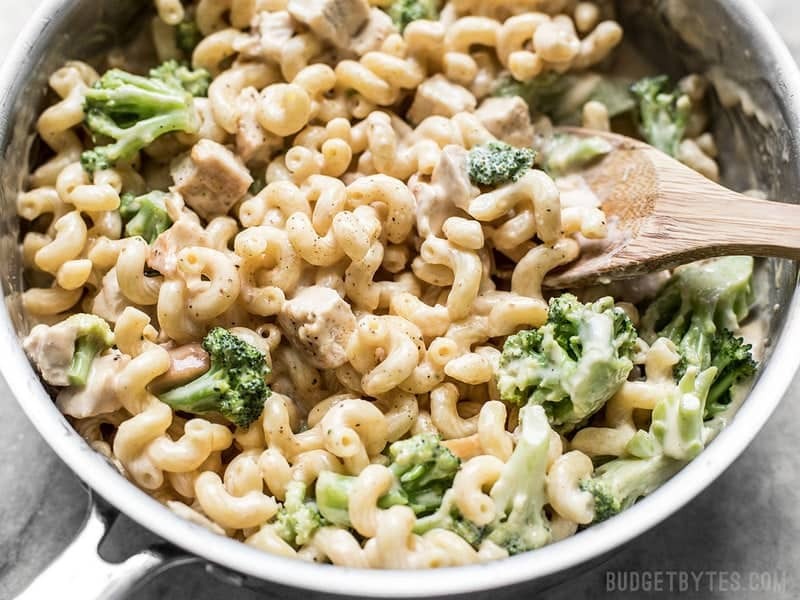 Add the cooked and drained pasta and broccoli, and the chopped chicken to the skillet with the cheese sauce. 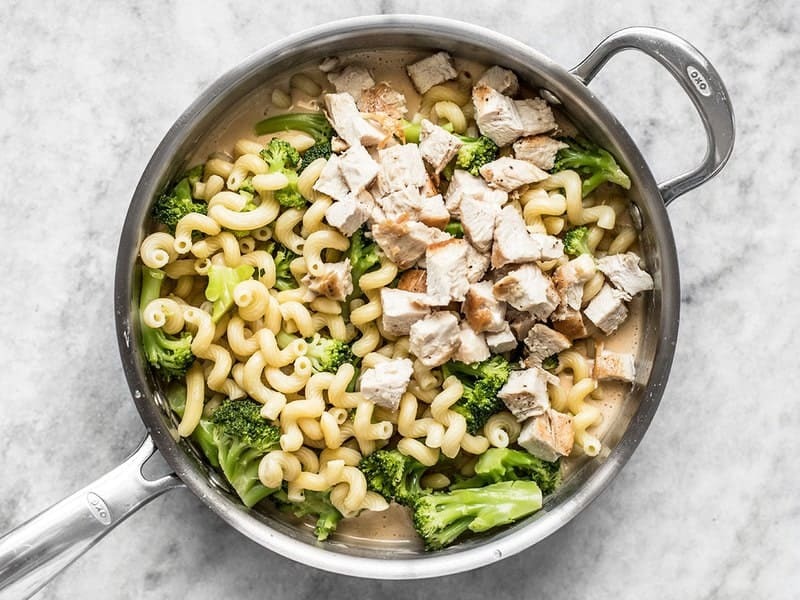 Stir to combine and fully coat the pasta, broccoli, and chicken in the sauce, then enjoy! Start by cooking the pasta and broccoli. Bring a large pot of water to a boil, then once boiling, add 1/2 lb. pasta. Continue to boil until the pasta is tender, then add 1/2 lb. frozen broccoli florets and continue to cook for 2 minutes. 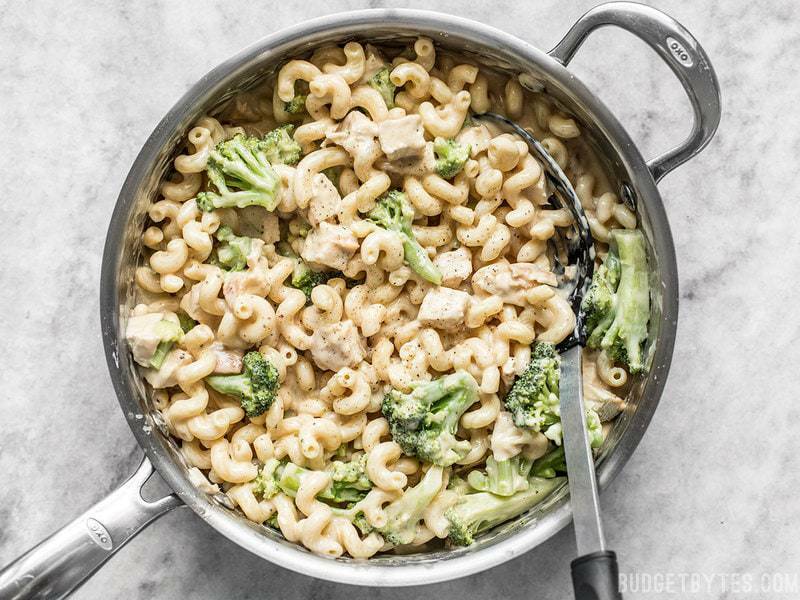 Drain the pasta and broccoli together in a colander. While the pasta is cooking, prepare the chicken. Season one boneless skinless chicken breast with a pinch of salt on each side. Add 1 Tbsp cooking oil to a large deep skillet and heat over medium. Once hot, swirl the oil to coat the skillet, then add the chicken. Cook the chicken on each side until golden brown and cooked through. Remove the chicken to a clean cutting board, let it rest for five minutes, then chop into small cubes. Turn the heat under the skillet used to cook the chicken down to medium-low and add 2 Tbsp butter. Allow the butter to melt and use a whisk to begin scraping up the browned bits from the bottom. Pour in 1 cup evaporated milk and continue to cook and whisk until all the browned bits are dissolved off the bottom and the evaporated milk is hot. Season the evaporated milk with 1/4 tsp garlic powder, 1/4 tsp smoked paprika, and 1/4 tsp salt. Now that the evaporated milk is hot and well seasoned, begin adding the 8oz. shredded extra sharp white cheddar, one handful at a time. Whisk the cheese into the sauce until fully melted before adding the next handful. Once all the cheddar has been added, the sauce will be smooth and thickened. 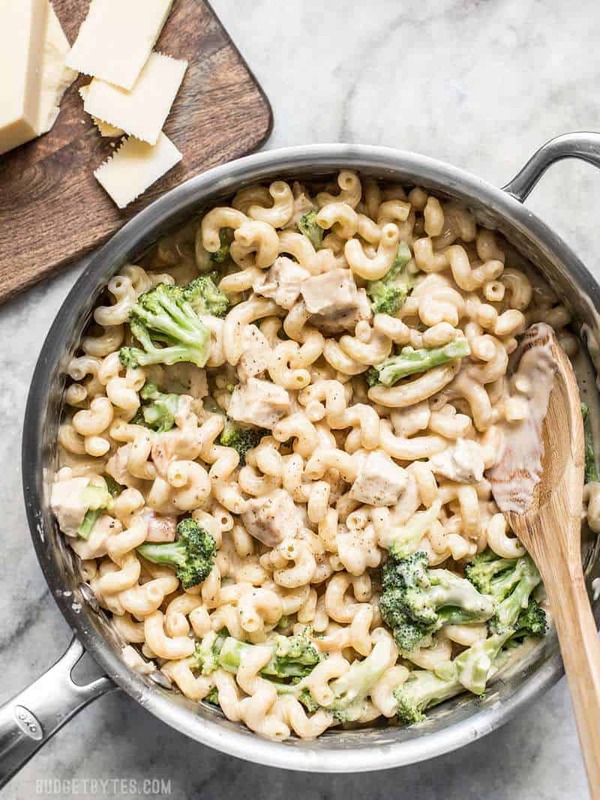 Add the cooked and drained pasta, broccoli, and chopped chicken back to the skillet with the sauce, then stir to coat. And that’s it! 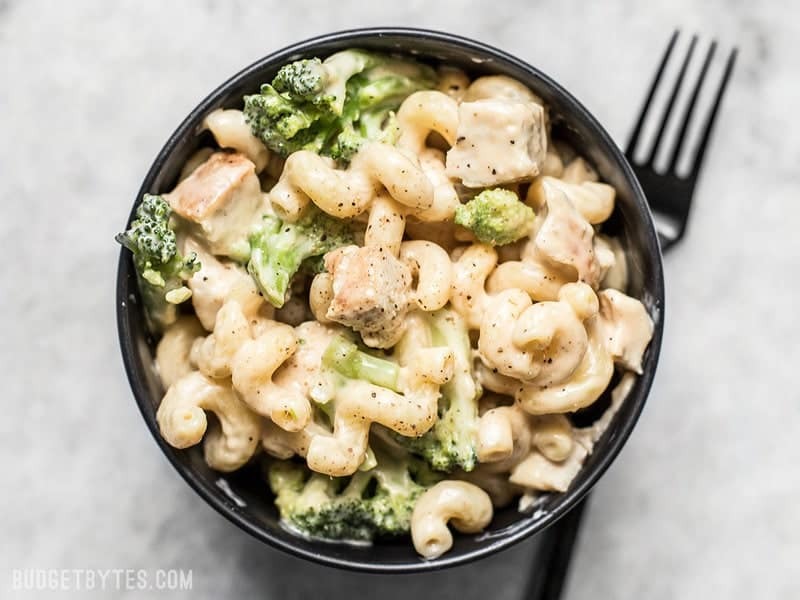 White Cheddar Mac and Cheese with Chicken and Broccoli is served!! Can I use fresh broccoli florets instead of frozen? Should I add them to the water with the pasta in the beginning or can I add them towards the end like with frozen? Thanks! But this came out so good and it was super easy. Not yo mention healthy. My 5 year old daughter loved it. What other vegetables do you recommend that can be added to this ? Broccoli is definitely my go-to, but peas or spinach also work great! Best homemade Mac and cheese I’ve ever made! :) thank you! This meal, was sustaining and balanced (even though i would have added more broccoli 😋). I doubled the recipe because cooking daily in a small rv is not efficient. Given that, I still prefer more seasoning than was listed. I used penne pasta, per my so’s request, which grabbed the cheese sauce nicely. I will probably make this again, but would try a different cheese or blend for even smoother final consistency (the sharp white cheddar gave it a grainy texture as it coagulated/cooled down). So I don’t usually comment on recipes, I made this exactly as written and my husband straight up lost his mind. I can’t remember the last time he loved a random weeknight dinner this much, especially something that was this easy to make. You are now a legend in my house. The cheese was impossible do do and came out terrible :( Maybe I am just a bad cook. This does not seem to be for beginners. I ended up just adding butter to the noodles and sprinkled some other cheese on top. Turn heat down to low before adding cheese. Natural cheese with clump with too much heat. YES…just yes. This was delicious!!! I am eating a bowl right now!! This recipe is a keeper and I am gonna make it again – thank you so much!! This was SO EASY and SO DELICIOUS! I used orecchiette from Trader Joe’s (fine but kinda crumbly w/ lots of broken pieces) and a chicken thigh (which I bought extra of so that I could make the honey mustard chicken! ), and it was SO GOOD! I haven’t tried the leftovers yet but I’m sure they’ll be amazing. The sauce was soooo creamy and yummy. I enjoyed the recipe it was great. I used yellow sharp cheddar and still turned out good. This tasted a little strange to me at first, I think perhaps because of the evaporated milk, but what I really liked was how good this tasted cold. I also liked how the sauce didn’t congeal like most mac & cheese sauces and stayed “gooey” long after refrigeration. It’s been super hot here in La La Land and any meal that can be eaten cold but still tastes good (I actually think this dish tastes better cold than hot) = WIN!